64 Yoginis come into focus when references are made to the dark side of Tantricism. The cult of tantrics profusely flourished in the 8th century where it reached its peak. Today we have just 4 of these temples scattered across our indian landscape. 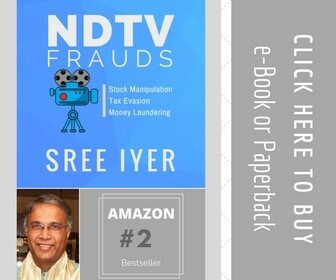 Two of these are located in Orissa at Hirapur and Ranipur Jharial, one is in Madhya Pradesh in Bheraghat temple and one supposedly in Tamil Nadu. 64 Yoginis appear like they are in a wild trance with Lord Shiva. Here the rhythms are quite different, the music is stranger and the flavour is wild. Bhavabhuti once expressed in the Malathi Madhava, the very same beauty of these Kanyas in the rituals of tantricism associated with the Mother Goddess, though the tantric played a villainous role of attempting human sacrifice. This is not a celebration of the infamous ritual practice but a poetic peep into this world of Gods and Goddesses, a part of our better known Shiva and Kali. The focus is on the cosmic truth, the only truth that lies in front of us that we run away from - Death. 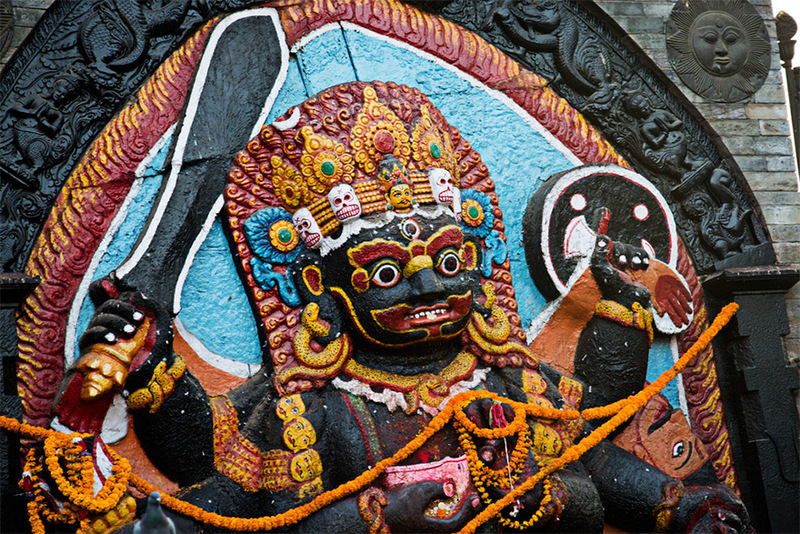 The form of the Lord here is Bhairava who brings us face to face with this truth. Truth is indigestible and this probably needs a different kind of understanding. Bhairava is charming and wild as a thought but coming face to face with Bhairava means playing with fire. Bhairava, popularly depicted as a naked mendicant, like Bhikshatana with a dog on his side and jatas in flames, a face with fangs and a fierce expression, one we would barely call charming. Bhairava teaches the art of Mrithyunjaya, or the conquest of death, which is our only redemption. 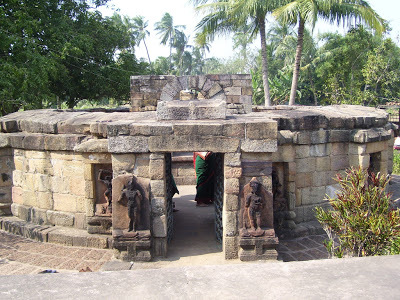 The chaunsat yogini temple of Hirapur is roofless and gives the impression of a womb. 64 goddesses circle its sacred enclosure within whose center stands a platform for ancient Tantric sacrifices or may once have hosted Lord Bhairava who is now missing. Here feminine beauty is not just depicted with care but is worshipped with as much ferver. The Goddess is depicted with her assets enhanced, her power and strength, her attributes completely sculpted to perfection emphasize the miracle of life and procreation. 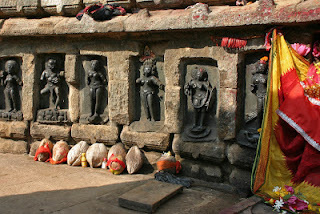 Ajaikapada Bhairava or the one legged Bhairava is depicted in one of the niches of this temple. At the Chaunsat Yogini temple of Ranipur its a little different. These 64 yoginis are sensuous maidens who dance with the Lord in Odissi, a wilder and more terrifying form is depicted as compare to the familiar sweeter Krishna Leela. Here is passion of a different kind that celebrates procreation in a different form, far more raw and probably indigestible to our minds today. Here too there is life, there is pleasure and warmth with the Lord and the Goddesses. It gives a feeling of awe, of something mysterious and sacred. Bhairava takes center stage at the Chaunsat Yogini temple in Ranipur. He stands within his mandapa, in a fierce fiery dance revealing the truth of procreation and death. In the crackling flames that light up this deserted temple we witness 64 maidens almost naked dance the Odissi, like Kanyas, with complete grace around Bhairava. As the smoke rises and transforms this roofless temple into a magical theater, 64 dancing damsels create life with the Lord. With sentuality in the air, red bangles cling creating music so wild, so powerful and so potent, this is a different world of the living. This is a wild world of Shiva Leela, a little beyond our conditioned imagination! These powers came alive as human blood once flowed through in offering.